Balanced Pool Water is Healthy Pool Water! Make sure you print off a copy and keep this with your pool records. Read below to learn about all the different parameters. Have your pool water tested and balance your pool water at minimum every week. What is Balanced Pool Water? Balanced pool water is water where all the chemical components added to water are in the optimal balance to create beautiful and safe swimming water. 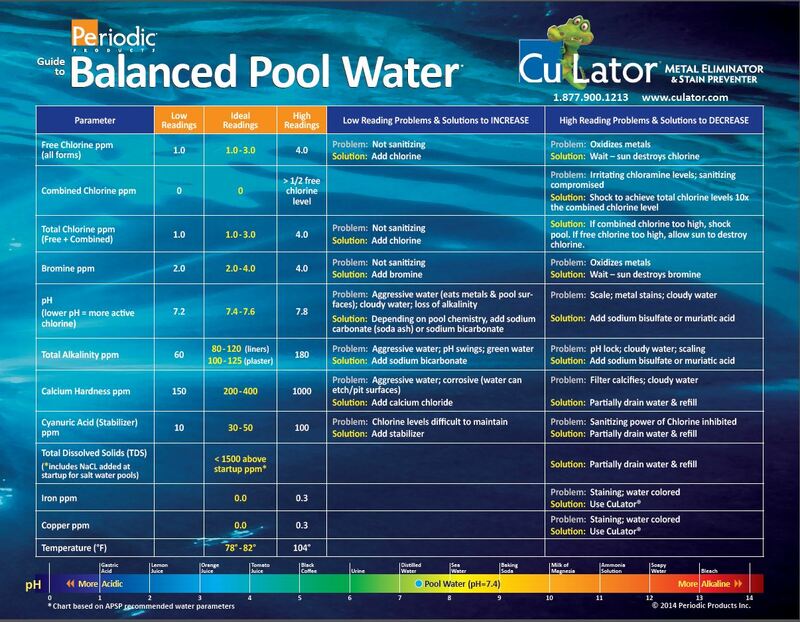 Why is balanced pool water important? If one parameter is out of balance, it will affect the other parameters and create problems for the pool and personal safety. How do I test for balanced pool water? Have your pool water tested at a local pool store, by your pool professional, or use a pool test kit. You should test at least once a week and re-balance. For better results test every few days and re-balance. What is the minimum chlorine needed to swim safely? For residential pools 1.0 free chlorine is needed. Free “available” chlorine is chlorine in your pool that is ready to kill bacteria and algae. A minimum of 1 ppm is necessary to swim safely in your pool. Combined chlorine is the chlorine that has already been “used up” sanitizing your water. Chlorine molecules combine with ammonia and nitrogen compounds in the water to form chloramines. Think of chloramines as body waste products combined with chlorine. When your pool smells like chlorine, or your skin smells like chlorine after swimming, you have chloramines and you need to add more free chlorine to sanitize the pool. If the Total Chlorine in your pool is higher than the Free Chlorine reading, then the difference between the two represents the level of Combined Chlorine. This means the pool is not sanitized properly. If the readings are the same, then no Combined Chlorine is present and your pool is clean. Both Free and Combined chlorine numbers should be the same and above 1 ppm. Sanitizer generally used in spa and hot tubs. Chlorine activity is pH dependent. pH is a measurement of the level of the acidity or basicity of a liquid (water) on a scale of 0-14.
pH 7 is neutral. pH Less below 7 is acidic. pH greater than 7 is basic or alkaline. 7.4 to 7.6 ideal for most pool water. pH Influences the ability of chlorine to sanitize pool water. Algae growth also raises pH. Acid, trichlor, dichlor, and rain water also lower pH. Alkalinity is the measure of the pool’s buffering capacity to resist pH change. Makes it difficult to maintain desired pH. Is associated with a low pH. Makes it difficult to adjust pH. Can cause pH lock (pH stuck at a certain level and is difficult to change). Is associated with a high pH. Calcium hardness refers to the amount of calcium and magnesium in water. Water about 100 ppm of hardness is called “hard” water. Swimming pools require hard water between 200-400 ppm. Can be corrosive to equipment and can release metals into the water. Can etch and pit plaster surfaces, releasing metals into the water. Drain some pool water. Rain water also reduces hardness. Cyanuric acid is also called CYA, stabilizer, and conditioner. It is used in pools water which is exposed to the sun to help reduce the rate of decomposition of free “available” chlorine by the sun’s ultraviolet rays. Cyanuric acid helps “stabilize” the chlorine so that it doesn’t burn off too quickly. High levels of cyanuric acid are most often caused by using chlorine tabs or pucks. If you use these all the time, you will have a high level of CYA and chlorine lock. The best solution is to use a combination of chlorine tabs and liquid chlorine (or non-stabilized shock) to control the CYA levels. By testing weekly you can watch your CYA levels. Drain water. Rain water will also dilute and reduce the CYA level. TDS is the sum of all of the things dissolved things in a body of water. TDS is everything in the water that is not water. It includes hardness, alkalinity, bromides, cyanuric acid, chlorides, cyanuric acid, sulfates, silicates, and all manner of organic compounds and metals. Iron levels must be performed with a “Total” test to get accurate results. Levels above .3 ppm may cause staining. Ideal level is 0.0. Copper levels must be performed with a “Total” test to get accurate results. Levels above .3 ppm may cause staining. Ideal level is 0.0. As water temperature increases, the water balance becomes more basic and scale-forming. As water temperature decreases, water becomes more corrosive. Temperature should be measured, but cannot be adjusted to achieve saturation or balanced water. Ideal temperature is 78-82 degrees F.
So, now when you ask yourself, “Is my pool water balanced?” or “How do I balance my pool water” or “How often should I test my pool water?” or “Is balanced pool water important” you have all the answers!